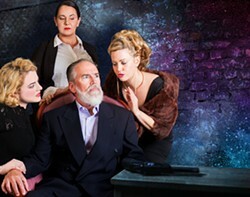 Clockwise from left: Jenna Donahue as Goneril, Nicole Halverson as Cordelia, Kim Haile as Regan and Scott Osborn as King Lear. The meaning of the word "Shakespearian" is elusive when tossed around by wags and pundits, and it's occasionally used with a little laziness. It's dispatched to label something as being multi-layered, and also looking deep into the souls of people who are contradictory and perhaps doomed of their own making. King Lear has great fame, if a little less heft than Macbeth and Hamlet in the pantheon of the Bard's dark stories. 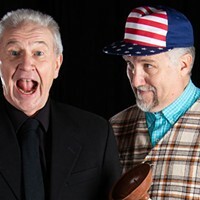 It certainly hasn't dropped out of sight; Lear has been staged for centuries, adapted on film aplenty and served as a template for countless works. And now that it's onstage at the North Coast Repertory Theatre, one is powerfully reminded how something can be so gloomy and lively and relevant all at once. Director Tyler Egerer, in his debut at the helm, sets the play in the 1980s. This is a decade ripe for nostalgia, though less so for me, having lived through it in my formative years. That said, you could hardly land a better era in which to set a modern dress-staging of King Lear. In the collective memory, that decade's touchstones include greed, avarice, excess and ruthless acuity. For a tale of the cunning daughters and courtiers of this aging monarch, this is a very good fit indeed. King Lear (a great Scott Osborn), in the twilight of his reign, decides to divide his fortune and realm among his three daughters. Nice as this may sound, it's immediately clear it's not as simple as that. The king cherishes most his youngest daughter, Cordelia (Nicole Halvorsen) but it is her outspokenness that leads him to angrily disinherit her and divide what remains between Reagan (Kim Haile) and Goneril (Jenna Donahue). For much of the arc of the story, Goneril and Reagan are interesting counterpoints in their scheming. As Albany, Goneril's husband, a very sharp Christopher Monero is great throughout and Donahue does a particularly good job at exuding a certain royal haughtiness and privilege, always making the best of the scenes she's in. To say too much more about the story of King Lear would be pointless; one either knows this story well or not, and if you fall in the latter camp it's best to see what unfolds over the two acts. Watching what comes of the daughters' plans and various betrayals, as well as the actions of other characters as the king becomes more withdrawn, is a compelling and visceral experience. Among the supporting cast, Brad Harrington as Lord Gloucester and Emma Johnstone as Edda, doing a gender swap for Gloucester's son Edgar, also turn in good performances. King Lear is a dense, wordy work, and the few flubbed lines and missed cues on the night I saw it were not surprising. The 1980s setting seems to get better as things go along. Costume designer Calder Johnson, in one of his many hats at NCRT, does a great job with the leather pants/skinny-tie fashions of the era that convey aspects of characters both central and peripheral, as do small touches like the daughters' propensity for doing rails of coke and swilling fancy martinis while plotting aloud with their depraved cohort. Johnson, by the credits, also seems to have headed up the set and scenic design with its appropriate spareness for both the time setting and the story. King Lear may not be everyone's cup of tea. To dial back to the start of this review, perhaps it doesn't have the wallop of Macbeth or the emotional sweep of Hamlet. It may not be the end all, be-all of Shakespeare's tragedies, if such a sub-category even exists. But NCRT's production is worth seeing. It endures as a tale of the decay of a dissipated ruler, with his reign and title bickered over by children, in-laws, hangers-on and ambitious shady scoundrels. Of course, it plays better on stage than in real life. 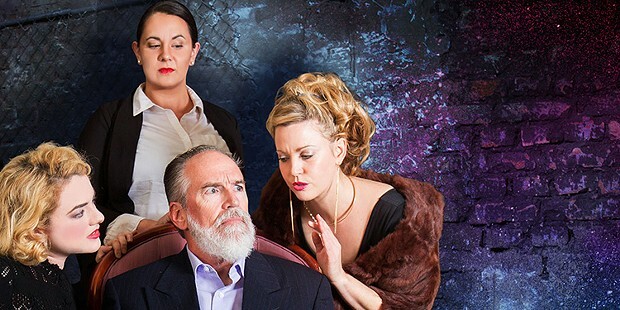 King Lear plays at the North Coast Repertory Theatre in Eureka on Fridays and Saturdays at 8 p.m. through Feb. 10, and also on Thursday, Feb. 8, with Sunday matinees at 2 p.m. on Jan. 28 and Feb. 4. For more information, call 442-NCRT or visit www.ncrt.net. Enjoy the worst double-date ever when Edward Albee's Who's Afraid of Virginia Woolf? 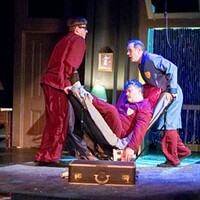 opens with a preview on Thursday, Jan. 25 and continues through Feb. 4 at Ferndale Repertory Theatre. Call 786-5483 or visit www.ferndalerep.org.